How to Grow Stevia | Grow This! Stevia is a native herb of South America that, while containing zero carbohydrates and zero calories, has been measured up to 300 times sweeter than cane sugar. Stevia has proven to be a safe alternative to sugar for diabetics and people trying to diet. Stevia makes a lovely addition to the herb garden, particularly if you are cultivating an herbal tea garden. Here’s a guide on how to grow stevia. Stevia is a perennial in warmer zones (9-11, or 8 with protection) and can be grown as an annual in cooler areas (or indoors year round). Plant stevia in the spring, just after the danger of frost has passed. It prefers the summer temperatures of moderate climates and should be grown over fall and winter in frost-free regions like Hawaii and parts of the Gulf Coast. Stevia can be successfully grown in every region of the U.S. While it is hardy in zones 8 and warmer, you may want to bring it indoors for winter in cold climates. Stevia also grows well in pots. It’ll grow in small containers, depending on how much you want to grow. Choose at least a 12-inch pot for good results. Whether growing in pots or in the garden bed, be sure stevia gets full sun for great results. Most stevia will grow from 1-3 feet high. Plant stevia in a rich, well-draining soil. Amend garden soil with plenty of compost prior to planting and add one part sand to ensure good results. Test the soil pH to be sure it’s at 6.3-7.2. Stevia can be grown from seed but germination can be difficult and seeds are tough to find. Plant seeds indoors under grow lights 8 weeks prior to the last frost for your area. You’ll need to keep temperatures between 70° F – 75° F. Keep the seeds moist. For better results, you may need to build a plastic dome around the pot. It’s much easier to start from rooted cuttings or transplants. Root cuttings do not need hormone powder to sprout, but they’ll need 12-16 hours of light. Use a grow light to be sure they sprout fast. Take cuttings in March. Keep grow lights no more than 9 inches above the cuttings until they develop into healthy seedlings. Transplant them outside in May or June. Thin or set transplants to about 18 inches apart. Harden off seedlings for about a week before setting them outside for good. Water stevia regularly, usually once the top inch or so of the soil dries out. Do not over water. Stick your finger in to test the soil until you establish a consistent routine. Container plants dry out faster and keep a close eye on them during long, dry spells and hot weather. When weeding, take care not to harm the fragile stems and roots of your stevia plants. It’s better to mulch around the plant after the warm weather sets in. This will help take care of weeds and also provide good soil warmth and moisture, a necessity in hot, dry areas. Prune the top of each plant once they are 8 inches tall and again a few weeks later. This will encourage branching and result in a wider, fuller plant that is better for harvest. A plant that wilts and won’t recover after watering probably has soggy, rotting roots. This is a result of poor drainage and/or over watering. Fungal disease can be problematic too in high humid areas. Avoid overhead watering and harvest at the first signs of disease. Stevia is generally not bothered by other diseases and insects tend to stay away from it. All the same, keep an eye out for aphids, thrips and whiteflies. Harvest stevia leaves as needed once the plant becomes full and well established. Try not to harvest too much at once, usually no more than 1/3 of the leaves at a time. In the early fall, flowers will appear. Harvest the entire plant, leaves, buds and all before the flowers bloom. The plant may taste bitter if you harvest after the blooms have opened. Harvest in the morning for the sweetest flavor. You can also harvest half of the plant at mid summer and the rest in the fall before the first frost. 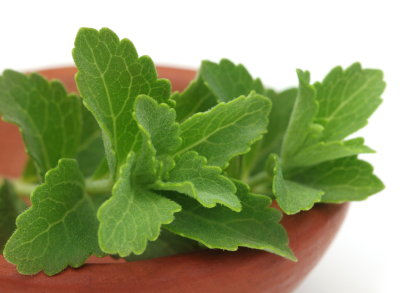 Stevia leaves can also be dried out and stored in airtight containers for long-term use. Stevia is a natural antioxidant with many purported health benefits. Use fresh stevia leaves as sweetener in hot beverages like tea and coffee. Steeping them in cool water will not work. Stevia can be ground down into powder. Replant stevia every year if you plan to harvest at maximum. Production may wane after the first year if you harvest too much, too often. In zone 8, mulch over to protect the plant through winter. In colder areas, cut plants back to 6 inches and bring them indoors for winter.